Biography of Italian Painter of the Bolognese School.  Classicism and Naturalism in Italian 17th Century Painting. An important member of the Bolognese School of painting, the most influential tradition in the transition from 16th century Mannerism to 17th century Baroque art, Domenichino (Domenico Zampieri) is best known for his fresco painting and large-scale altarpiece art, especially during the period 1610-25, when he was a highly influential painter in Rome. His drawing too, was exceptional, as also was his portrait art. Influenced by Correggio (1489-1534), Raphael (1483-1520) and Caravaggio (1571-1610), he became one of the most important successors of Annibale Carracci (1560-1609) and his school. His decorative art included masterpieces like the frescoes in S. Andrea della Valle, St Nilus Chapel, and the Polet Chapel in Rome. His best altarpiece is probably The Last Communion of St Jerome (1614, Pinacoteca, Vatican); his best portrait painting, Pope Gregory XV and Cardinal Ludovico Ludovisi (1621, Museum of Fine Arts, Beziers); his greatest mythological painting, probably The Hunt of Diana (1617, Galleria Borghese, Rome), while the best examples of his landscape painting include The Ford (1604, Galleria Doria Pamphilj, Rome) and The Labours of Hercules (1623, Louvre). He remains one of the great Old Masters of the Bolognese tradition. After a short apprenticeship with the Mannerist painter Denis Calvaert, Domenichino (Domenico Zampieri) attended the school run by Agostino Carracci (1557-1602) and Ludovico Carracci (1555-1619), where he soon distinguished himself as an extraordinarily gifted decorator. 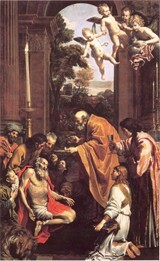 He worked with the Carracci on the decoration of the Oratory of S. Colombano (The Entombment). In 1602 he went to Rome to study in the classicizing circles dominated by Annibale Carracci, and collaborated with him and other pupils on the decoration of the Farnese Palace (Girl with Unicorn, Narcissus). Although he quickly settled into a monumental style of Baroque painting, on lofty themes, Domenichino also, throughout his life, made landscape paintings, mostly small canvases that reveal a freshness of observation and a profound feeling for the beauty of nature. These works, which are hard to date, are also echoed, throughout his career, by the landscape backgrounds of many altarpieces. The finest examples of landscapes are St Jerome (Glasgow Art Gallery); The Baptism (Cambridge, Fitzwilliam Museum); the two Histories of Hercules, as well as The Flight into Egypt and Hermione with the Shepherds (all in the Louvre). Domenichino's first major success, a fresco depicting the Flagellation of St Andrew, in the oratory of S. Andrea in the Church of S. Gregorio al Ciclo, was painted in 1608 (in competition with Guido Reni (1575-1642), who was decorating the opposite wall). His two masterpieces followed: the fresco decoration of the St Nilus chapel in the Abbey of Grottaferrata (Lazio), and that of the Polet chapel, dedicated to St Cecilia, in the Church of S. Luigi dei Francesi, Rome. Before painting the Life of St Cecilia (1614), he had started an altarpiece showing the Last Communion of St Jerome (1614, Vatican). This work is full of brilliant colour, which was unusual for Domenichino, who, except in his landscapes, generally adhered to the classical norms derived from High Renaissance painting (c.1490-1530). This same pictorial strength, which is characteristic of this particular phase in his development, reappears in the two large frescoes of S. Luigi dei Francesi. Within the framework of an arrangement based upon the famous models of Raphael, the paintings contain fine naturalistic observation that bears witness to the fact that Domenichino was closer to life and to reality than to ideal images based on the theories of beauty that he himself had developed. In the years that followed Domenichino gave himself over to a rigid classicism that involved him in an over-intellectual view of the past and stifled his own more original inspiration. The mythological frescoes of the Villa Aldobrandini in Frascati (1615-16, National Gallery, London), The Hunt of Diana (1617, Galleria Borghese) and the frescoes in the vault of the choir of S. Andrea della Valle (Scenes from the Life of St Andrew, 1622-7) show him at his best, creatively, inspired by the poetic ideas of ideal beauty. But during this same period he produced many other works that cannot be set on the same level and that also reflect an incurable crisis. He stayed in Fano for a while, then for a longer period in Bologna, and eventually went to Rome where Pope Gregory XV named him pontifical architect in 1621 and obtained for him the commission for the decoration of S. Andrea della Valle. Gregory XV's early death and the rise of more modern painters, such as Giovanni Lanfranco (1582-1647) and Pietro da Cortona (1596-1669), left Domenichino, who had nevertheless produced some of the most important works of his time, very much isolated in Rome, and little appreciated. He left and went to Naples where he settled in 1630 after accepting a commission to decorate the chapel of S. Gennaro in the Cathedral. After an unhappy time, both personally and artistically, he died, having failed to complete the work or establish himself as an influential member of the Neapolitan School (1600-56). See also: Neapolitan Baroque. Acknowledged during his lifetime as one of the top Italian Baroque artists of the early seventeenth century, his reputation soared even higher during the eighteenth century, before fading in the nineteenth century, as a result of criticism from the celebrated English art critic John Ruskin (1819-1900). It recovered significantly in the second half of the twentieth century. Paintings by Domenichino can be seen in many of the best art museums around the world.  For more biographical details of Baroque artists, see: Homepage.